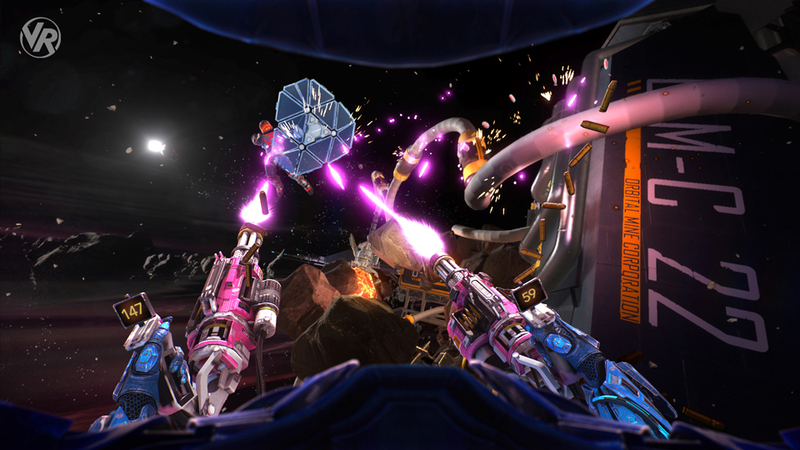 Space Junkies is an cross-platform online 4-player multiplayer shooter experience that takes place in…you guessed it, Space. Due to that fact, you are in a few zero-g environments and must cruise around those maps at top speed trying to not only hunt down your opponents but making sure you don’t become the hunted as well. The PC version allows for a little more personality. 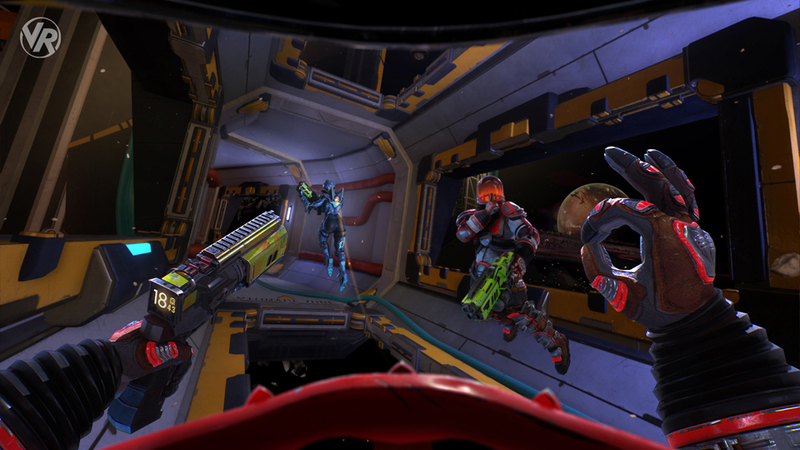 The base gameplay is the same across any headset, though differs between the PC and PSVR HMD’s. The PC side controls like you would think, as you float through the environment targeting your enemies with each hand holding a weapon of some type. Weapons and buffs are scattered throughout each environment and need to be manually grabbed in a free hand as you float by with an optional laser-sword and shield over each shoulder allowing for some varied gameplay. It can be tricky to master moving and using weapons like the sling shot or plasma canon and staying still can be next to a death sentence so on the PC side of things, I tended to stick with more traditional pistols and machine guns. The devs decided that the Moves were too limiting on the PlayStation side so the DS4 is the only option available, mapping both your hands to the controller and assigning the left and right triggers to each hand. Due to the tracking limitations of the DS4, those 2 handed weapons I mentioned earlier can now be fired much easier thanks to assigning the physical motions required to reload on the PC side to quick button presses. Weapons, for the most part, are reloaded by a shake of the controller and once you have expended their ammo, you can toss that gun aside, which will explode after a few seconds. Both versions of the game only offers only click turning which creates a few issues besides not accommodating those that can handle full locomotion, the largest being the advantage this gives PC players. The DS4’s tracking is very limited forcing PSVR players to stay facing the camera lest the game lose track of the DS4’s position. What that means is that the PSVR players are forced to use click-turning, whereas on the PC side of things, thanks to the superior tracking, players can spin in the real world faster then the turn option giving them a distinct advantage in the movement department. Also, because both hands are attached to the DS4, you can only shoot one target at a time whereas on the PC side both arms can be used separately though more often than not, you’ll be trying to take out one competitor at a time anyways. The action can get pretty intense! 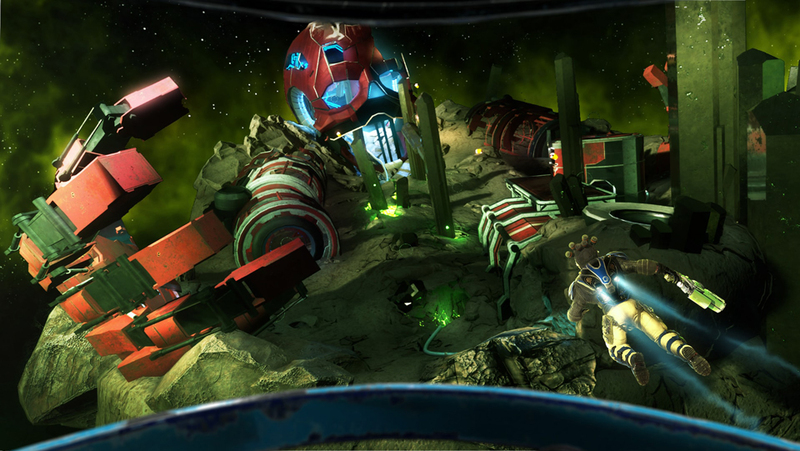 Space Junkies shines in the visual department with some detailed and differing levels that take you into an asteroid, space station and a few other locales. Lighting effects are top notch with explosions and shadow effects all looking great. As this is cross-platform, it’s easy to tell who is playing on the PC side and who’s hands are stuck to the DS4 though either controller(s) are tracked wonderfully with PC side having a few more animations then the PS4 like pushing off other surfaces and hand gestures, though these are just visual changes and don’t affect the gameplay. Certain stages have destructible walls while others may have moving machinery that can crush you should you get caught in between it. The hub area before a match starts has a few beach balls and hoops lying around for those that maybe want to play a game of space-ball(?) or mess around with the randomly spawned weapons which, when picked up, change an in-room display to showcase how that weapon is used. You can customize the look of your character thanks to rewards through levelling up or an in-game currency that I could not figure out how to acquire at the time of this review. The sound design is absolutely fantastic thanks in large part some amazing 3D audio that let’s you hear everything happening around you. Many times, an audible clue was the only indication of a nearby enemy as you can hear any of the actions, they perform making stealth a decent strategy for those that prefer to be a little sneakier. In-game voice chat is also available though needs to be cranked up as no matter who you are talking too, they are too quiet and moving away from them, even by just a few feet makes it near impossible to make out their words. Still, what is here is crisp and clean and I loved the theme song, which only plays during the main menu as the rest of game relies solely upon the sounds of combat. Dual wielding is the way to go! The controls here are going to be the most divisive issue, at least as far as PSVR users are concerned, and I’m happy to report that, overall, playing with the DS4 is a breeze. Playing on the PC side definitely offers more in the way of immersion but seeing as how the Move controllers are just so limiting, I don’t see how they could work without crippling the PSVR players. Matches are next to instantaneous, thanks in large part to the cross-platform play and no matter when I was on, I always seem to find the 3 guys I need for a full game. Not all weapons are created equal and depending upon what you grab, you may find yourself in a pickle, so I urge you to mess around and familiarize yourself with each weapon as they all have definite strengths and weaknesses. 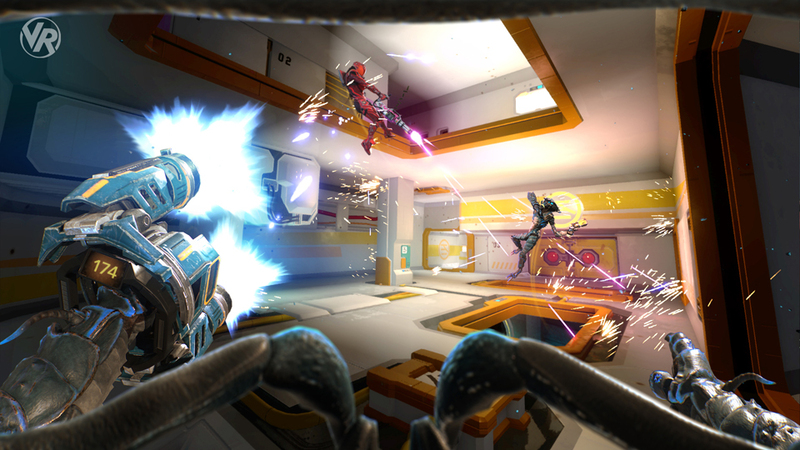 Besides just customizing your appearance, you can choose from a few different classes each with having different pros and cons, like more and less health and speed, to further tailor the game to your play style and you even have the option of swapping the aforementioned sword and shield for a health drink, EMP gun and a few other options allowing for some fun tweaks to the gameplay. There are also online leader boards and even the social screen output shows a scorboard with scrolling text about who is killing who during a match, like a sports broadcast. Each level offers its own unique obstacles. What would I pay? This gets a bit tricky as I’m not a huge Multiplayer gamer. With only a handful of modes and no more then 4 players in a game, I feel that the content is lacking for the $40 asking price. Like I said, this is a top-quality, very refined shooter, but for myself, $25 seems a little more apt here. 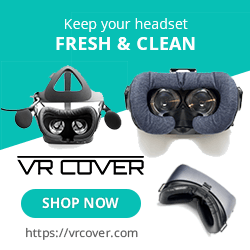 Ubisoft provided The VR Grid with a press code for this title and, regardless of this review, we thank them for that!